On arrival, Berlin feels instantly different to any other European city. The TXL airport is small and usually quite quick for clearing customs and picking up luggage. 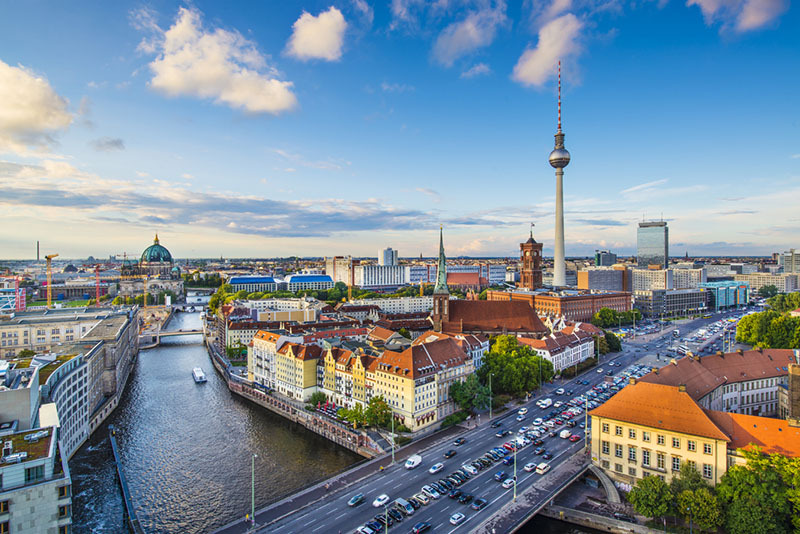 Berlin is one of the most famous cities in Germany for North American visitors, and with its colourful past and vibrant present, it’s easy to see why. We recommend booking a hop on hop off bus for your first day in Berlin. Your room may not be ready until later in the afternoon, making the bus a good option for getting acquainted with Berlin’s many neighbourhoods in comfort, even if that tiredness sets in. The open top bus is a great way to see around town. 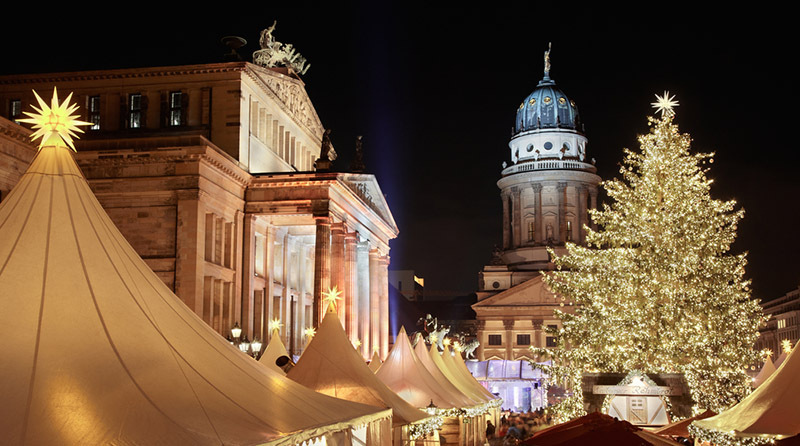 You can get off stretch your legs and stop at places like Checkpoint Charlie for a selfie with an ‘American’ soldier, or visit one of the many parks in summer or Christmas markets in winter for a snack and a drink. In the evening, take it easy and get your rest for a busy sightseeing day ahead. Waking up after that first full night’s sleep in your hotel is always a great feeling, especially after a long flight. After breakfast, get ready to hit the pavement! Berlin is a huge, but extremely walkable city, connected by a superb public transit system. You’ll find traditional European architecture in what was once West Berlin, while the rejuvenated East has a more industrial feel. Since you took the hop-on, hop-off tour on your first day, you should have an idea of what sights you’re interested in seeing, so spend your morning hitting those. Perhaps finish off back in Mitte, the centre of Berlin, with a cruise down the Spree. This afternoon can be spent taking a bike tour. This is a fun way to see this very flat city and a great compliment to the hop on hop off bus. Or, since you’re right next door, explore the treasures of Museum Island, in the Pergamon, Altes, Neues, and Bode Museums. This UNESCO heritage listed island is packed with beautiful works of art and history. 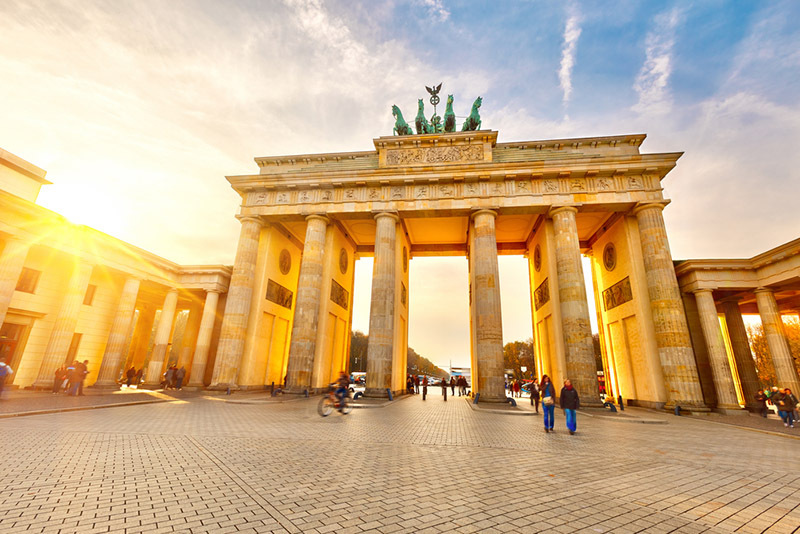 When you’re done, make your way up Unter den Linden to the spectacular Brandenburg Gate and the Reichstag parliament building, where you can ride the elevator to the beautiful glass dome. The view of the city from this high point is excellent any time of year but really as the sun is setting, it makes for an even more spectacular lookout. Remember to bring your passport if you plan to do this as they will ask for proper photo id. Tonight you will head out and see the nightlife of this city. Berlin is world renowned for its clubs and nighttime atmosphere, and there really is a club for everyone in Berlin. You could find a place specialising in ballroom dancing, salsa, techno, or countless other options. Berlin at night is a place to get out and explore. Waking up on your last day may not feel the best, so take it relatively easy. Get out and grab some last-minute souvenirs, explore famous shopping streets like Kurfurstendamm (don’t miss a stroll through iconic KaDeWe, including their famous food hall on the top floor), or Christmas markets if they’re open. There are plenty of places where you can collect a memento of your Berlin visit. Just keep in mind, most stores are closed on Sunday, so perhaps make that your day to stroll through the vast and beautiful Tiergarten No matter how you spend your time in Berlin, within minutes of leaving, you’ll be planning your return! Europe Product Manager - Although born in Canada, Nadya has spent much of her life globetrotting, as her parents believed that travelling was a form of education. At 20, she packed her backpack and set off to Australia for a work holiday, where she would later return to earn her degree in Tourism Management. She has also lived and worked in Ireland. Having extensively explored Europe and South America, Nadya has since been to all 7 continents and is always looking to see and experience more.